J-Man can I ask which Series regulator you fitted? I have read a number of threads about those but it seems they are not without problems themselves. I am thinking once I fit the new flywheel and stator kit I will have less power at my disposal so an LED headlight upgrade should help and as I don’t ride the biffer over winter much (it’s too cold and icy in Scotland for that) I shouldn’t need to power heated gear other than my heated grips so all should be well. Have you had any problems with series regulators? At iNCORRIGIBLE: maybe you know already the stuff here below, but for completion in this thread in general I'll add a more extensive answer to what I said and make a summarise at the end. I have an electronics/electrics degree (I was 23 when I left school) but that is not the most interesting thing here I suppose. The cheapest way for regulating voltage is SHUNT based. The 3 red SCR's (or later MOSfets) literally short circuit the generator at given times. They are activated by the control unit when to perform their short circuit action. The short circuit current trough the coils render a magnetic field opposite to the magnets magnetic field, the net result is an overall lowered magnetic field. The effect of that is a lowered voltage output. This way the output voltage is controlled. - one has to burden the coils with an extra current to counter the flywheel magnetic field. So the decision of Honda to fit a flywheel with less magnetic strength is a logic one, if there is less magnets power to counter, one eventually has to counter less. Thus one needs less of the shunting current, which leads to lesser burden on the coils. The series regulators do things completely differently, there the regulating semi conductors are not parallel to the generator/load, but in series. If generator is producing 30 volts and we need only 13 volts for the bike, then the semiconductors will take the remaining 17 volts on them. - a lot more of local heat production in the regulator, in our example 17 volts times the used bike current, more cooling is necessary. - more electronics inside thus more expensive. I did a big thread once here to compare shunt vs series regulators and measure coil temperatures while riding. I do not suggest to dig trough it, I'll sum up the finals here for convenience below. Series regulator did lead to lower generator coil temperatures, but not that much as hoped for. Series regulators might extend the life of a genuine HONDA stator, but counting on preventing burning it completely is less likely. If I would choose for a series regulator again then I would only choose one that fits in the existing place, I would not bother again finding an alternative mounting place. The best way to cool the stator coils is to rev up (confirmed by the coil temp measurements) and keep that oil level to its max limit for best oil flow to stator section. To have a good idea if heading for a series regulator is worthwhile, then we need actually more data, more people's testimonies. What we have so far is mere anecdotal. About the discourse of words, I think we're all human and that shows sometimes. Lets not be too hard on our selves, excuses came quickly so no harm done? iNCORRIGIBLE: your asking for my degree can be interpreted in several ways, I hope it was really a harmless question and I'll give you the benefit of the doubt. Please feel free to add or correct my contemporary view on the matters with preference to the technical aspects, if you have any to share. * SH847 Shindengen aka Suzuki Part: 32800-31J00 <----- Mine, very much OK so far. 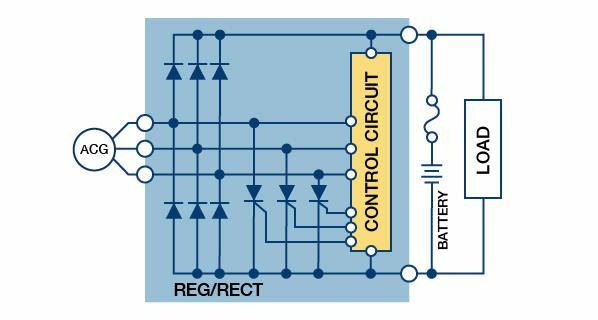 1.MosFet "switches" at the core of any control system versus SCR's. 2.Series Regulation of alternator output over Shunt Regulation. 3.Suitable cooling and /or siting/specification of the Rectifier/Regulator. 4.Quality specification of any replacement stator. 5.Appropriate maintenance of engine oil level( = the stator coolant). All content based on working observations & gut/experience so not authoratative.Edward. (There are old Engineers & there are bold Engineers....................................................................There are no OLD -BOLD Engineers. Am I the only one who hasn’t got the foggiest idea what’s being said here??? Sorry Phild.Just an overly deep discussion on how not to braise/ BBQ/Pot Roast your CBF Alternator.Ed. I have to say I’m enjoying this again now after today’s posts. Sorry to bomb you with questions J-man but here’s another thought I wondered about. If you fit LED headlight bulbs which take less power from what’s available from the alternator or stator in our case, does that mean the excess power left will have to be offloaded by the regulator resulting in more heat around the coils on the stator or does it not work like that? Is it not better to leave the original bulbs and burn what’s available or is that a worse scenario than using less power and allowing the regulator to burn it off in heat? Mentioning oil level, I wonder also if oil specification could change the cooling effect. I have read on here that the oil channels aren’t very efficient around the stator on the Mk1 biffer resulting in poor cooling of the stator. So what happens if you run an oil with a different viscosity? i.e a 5w30 fully synthetic instead of a 10w40 semi synthetic. It is sure to flow better around the engine so surely if you can get more oil around quicker that would aid cooling. I suppose I won’t have to worry now though as the new kit arrived today from Germany so in a month or so when I fit it, I can forget about the stator problems for a long while to come.
' Am I the only one who hasn’t got the foggiest idea what’s being said here??? ' - No.